In an article published in the Forum section of the US National Academies journal Issues in Science & Technology, Dr Eoin O’Sullivan, Director of IfM's Centre for Science, Technology & Innovation Policy, writes that the pace of technological innovation and increasing competition means advanced economies no longer have comfortably long “windows of opportunity” to translate new knowledge from research into manufacturing. Gregory Tassey makes a convincing argument that R&D investment in technology-based productivity growth is critical for long-term economic competitiveness. He points out, correctly, that the science and technology community often struggles to effectively make the case for the variety and scale of R&D investment required for the challenges of the global tech-based economy. 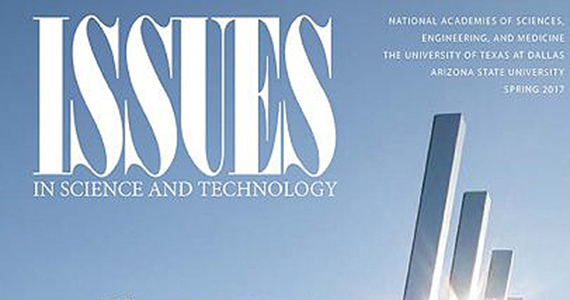 In his article, Tassey makes an invaluable contribution to addressing this problem by identifying and characterizing key categories of technology-related economic assets prone to market failures. The article should, however, be taken as a “call to action” for the science and technology community. More work needs to be done to translate understanding of particular technology innovation processes and systems, economic spillovers, and risks beyond just “general anecdotes and descriptions” into a practical and holistic economic growth strategy—one with targeted policies and a coherent evidence base, which can address specific market failures. One reason so many economists fail to appreciate the central role of technology in economic growth is that the sources of productivity improvement and market failure identified by Tassey occur within economic “black boxes.” An advanced theory of technology-based productivity growth, which can underpin more effective evidence gathering and policy development, will require opening up these boxes. Economists and policymakers will need to work with scientists, technologists, systems engineers, and operations management researchers, among others, to integrate more detailed understanding of the complex systems nature of technology-based products, advanced manufacturing systems, and global value chain networks. Tassey’s arguments are not only important; they are becoming increasingly urgent. As competing economies build comparative advantage, acquiring new capabilities to innovate high-tech products and develop ever more advanced manufacturing systems, countries such as the United States can no longer rely on the strength of their science and engineering research base to drive competitive productivity growth. The old twentieth-century model whereby technological innovation is driven by a small number of countries (those with elite research universities and major R&D-intensive corporations that dominate supply chains) is rapidly disappearing. The pace of technological innovation and increasing competition means advanced economies no longer have comfortably long “windows of opportunity” to translate new knowledge from research into manufacturing, or for supply chains and skills portfolios to reconfigure around high-value economic opportunities associated with emerging technology-based products. In this new era, a high-quality research base driving innovation, together with monetary and fiscal policies stimulating demand, may just not be sufficient to compete in the global tech-based economy. The capability to rapidly translate novel emerging technology R&D into manufacturing, and the ability to coordinate the complex manufacturing systems into which these technologies diffuse, may become the critical factors for enabling national economic value capture. Tassey’s argument for a technology-based growth policy—focused on coordinated investment in technology platforms, innovation infrastructure, institutions, and human capital—is convincing, timely, and urgent.